So it was a genuine delight to dip into "Play" to see what she thought of it. "Grown Up" Charlotte might maintain that she's above books like this, but it's incredible how timeless and fun these titles still are. 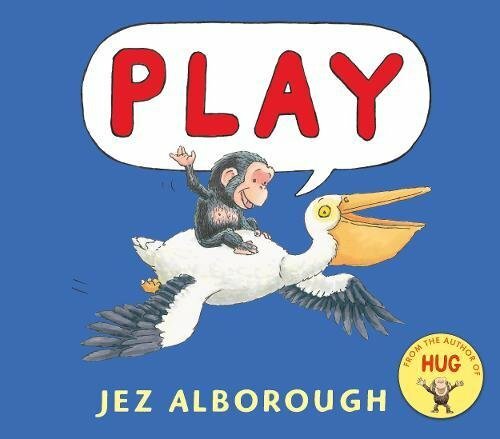 "Play" features a rather cheeky little chimp called Bobo who has a lot of fun out in the savannah. Bobo never wants to slow down, dashing here, dashing there and generally having the best time ever. Oh dear, tears before bedtime! All the other animals could really do with a break, as Bobo's games often involve them. But will Bobo behave and snuggle down as intended? It might be a bit of a struggle for Mama Chimp but once the sun goes down and Bobo is left all alone by his friends, will anyone rush to his rescue? Perfect for kids (like Charlotte) who just want to stave off bedtime until the last minute! Charlotte's best bit: Naughty Bobo really does get up to some hijinks! Daddy's favourite bit: Though Bobo might not think so, this is the perfect bedtime story for your madly energetic little ones. Just as fantastic as Jez's previous titles featuring this cheeky little chimp. "Play" by Jez Alborough is out today, published by Walker Books.